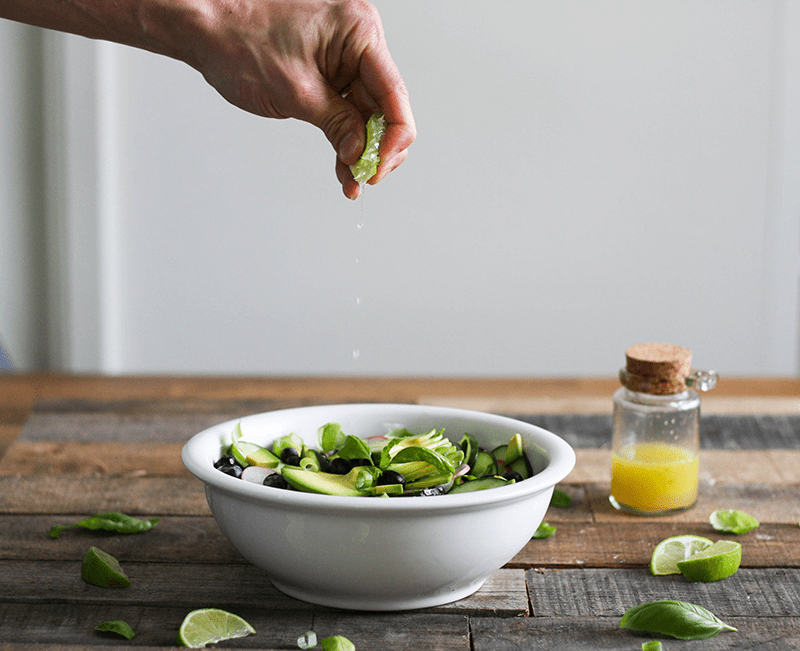 A refreshing and simple recipe for a healthy Cucumber Salad. This cucumber salad is a great make-ahead lunch that is quick to put together, gluten free and paleo friendly. It’s a healthy and filling salad that only takes 10 minutes from start to finish! Eat as is for a light lunch, or add grilled chicken for a balanced, high fat, low carb dinner. Every day I try to consume as many servings of veggies as humanly possible, but as you’ll soon learn, I’m a bit particular when it comes to the type and method in which I do so. That being said, I pose the question, “when did salads become synonymous with lettuce?” Sure there are plenty of leafy greens out there that can add some major nutritional value to a veggie rich diet, but personally I’m just not that into them. The ones I’m specifically referring to are a couple of greens that have been given a superfood status: kale and spinach. I do understand why they’ve been given this superfood classification; kale and spinach both contain iron, vitamin A, vitamin K, calcium, and antioxidants. But here’s the thing: I get iron from consuming grass fed beef, lots of vitamin A from pasture-raised egg yolks, ample vitamin K and calcium from the grass fed butter in my Iced Bulletproof Matcha Latte, and antioxidants from the matcha powder itself. (Side note – matcha, now that’s a super-powder.) So kale and spinach as I’ve noted, just aren’t that interesting to me. I’d rather stuff my face with veggies that fill my mouth with flavor, and fill my tummy with substance. So you can see that I’m not so much romanced by the thought of filling my salad bowls with leafy greens, but that doesn’t mean I’ve given up on salads all together. 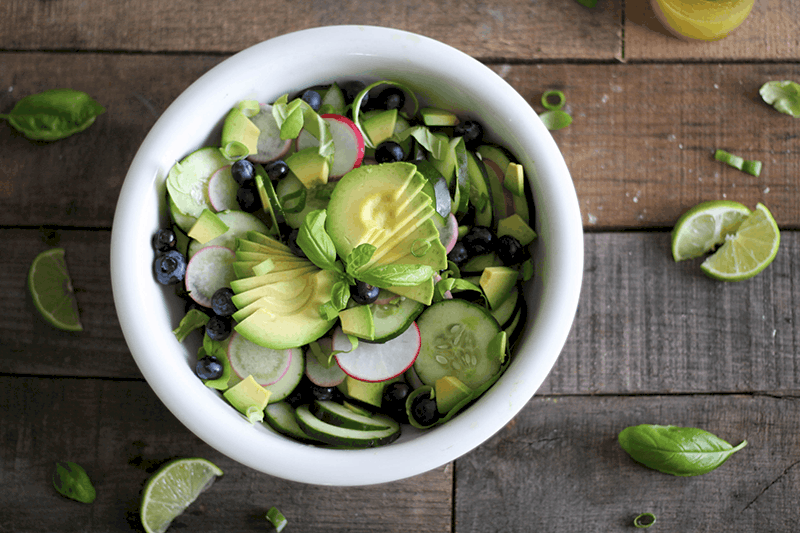 Introducing the Avocado Cucumber Salad. Lettuce-free salads. Gimme. Whether I’m hunting down some paleo appropriate ingredients at the Whole Foods salad bar, or throwing together a salad for the tomorrow’s lunch, I’m diggin’ the crunch and hydration I get from a lettuce-free salad. This Cucumber Salad recipe is no exception. You can prep this cucumber salad in advance and top it with your favorite dressing without having to force feed yourself a bunch of mushy and wilted leaves the next day. 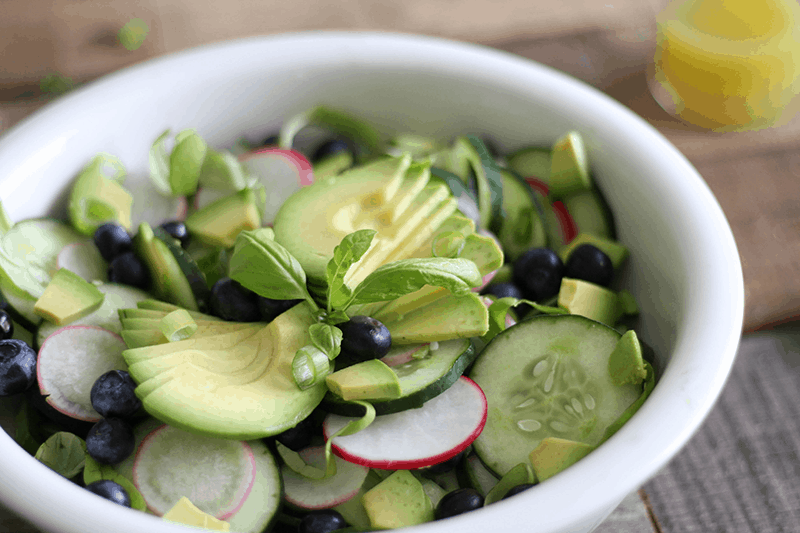 Just leave the avocado off until you’re ready to eat, and you’ve got yourself a killer make-ahead meal, with no risk of a salad-dressing-spill-in-the-lunchbox fiasco. 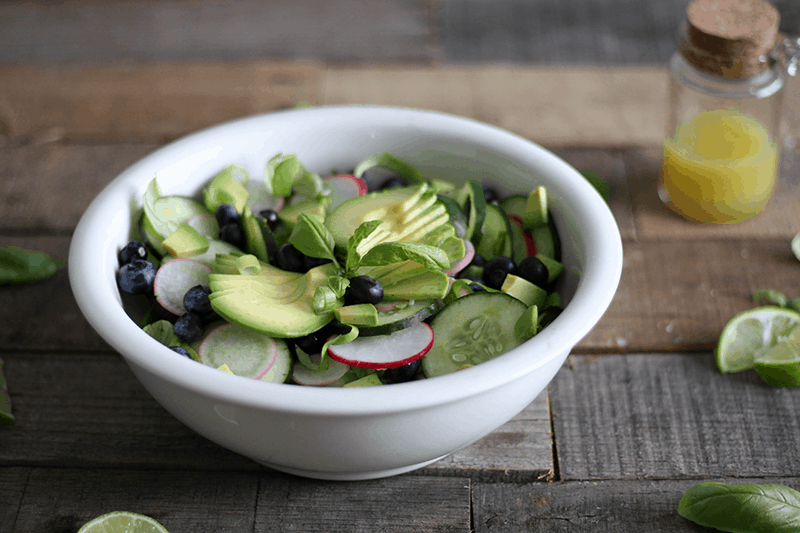 It may not be the average flavor profile for a salad, but you’ll love the creaminess of the avocado juxtaposed with the crunchiness of the cucumber, and the sweet pop from the blueberries offsets the peppery crunch of the radish. So give your tastebuds something to get excited about, and ditch your leafy greens. What is MCT oil, and why do I use it in my dressings? You’ve likely heard accounts of coconut oil having fat fighting benefits, right? When it comes to comparing coconut oil and MCT oil, the difference between the two is the carbon chain length in the fats. Medium chain triglycerides (the chain lengths found in both coconut oil and MCT oil) can reach a chain length of C6, C8, C10, and C12. While all fats and oils are composed of either short, medium, or long chain triglycerides, the MCTs are what our bodies metabolize most efficiently. MCT oil, which is so aptly named as it simply stands for medium chain triglyceride oil, is a very efficient energy source for our body. It bypasses the digestion and is very quickly converted into energy for your body and brain to use. This oil is composed of the C8 and C10 carbon chain lengths. These two chain lengths are the most “potent” of the medium chain triglycerides. The best, most potent of the MCT chain lengths is C8, which is caprylic acid—this type is the most rare. Our liver doesn’t need to process it at all, and it’s converted into energy incredibly quickly. If you’re struggling with sugar cravings, this oil will knock them right on down. For comparison, coconut oil only contains about 5-6% of C8. Coconut oil is primarily composed of lauric acid. While lauric acid is in fact a medium chain triglyceride (its carbon chain length is C12), it acts more like a long chain triglyceride, so you won’t get the quick, clean energy from it like you do from C8 and C10 chain lengths. MCT oil is actually a contributing factor in the way my Fat Focused Detox (my free 7 day detox) works so well at using fat to lose fat. MCTs are a body fat burning powerhouse! So, is it time to get down on some MCT oil dressing or what?! 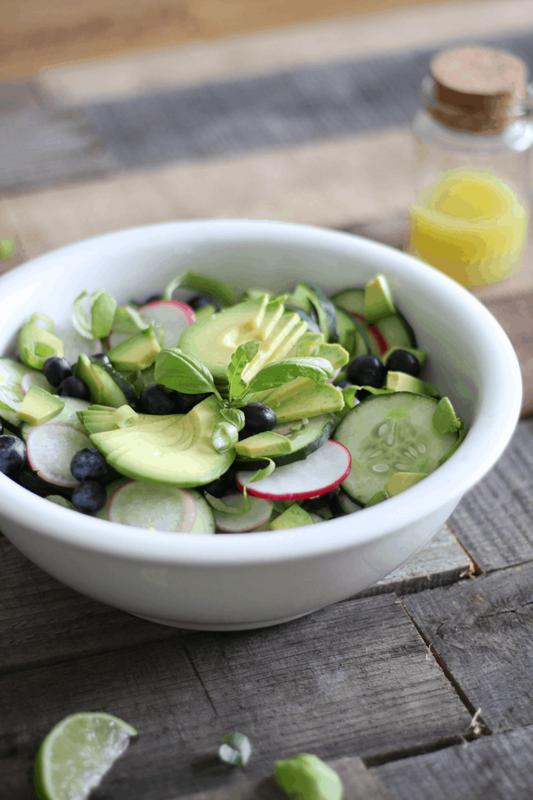 I shared the recipe for this Avocado, Blueberry, and Cucumber Salad and MCT Mustard Vinaigrette Dressing on Rubies and Radishes, so be sure to head that way!